Sage North America has just opened registration for their first stop on the Sage Sessions 2018 tour. As indicated in early January, 2018 these events will replace the single Sage Summit conference in 2018 although Sage’s announcement leaves the door open for a Sage Summit event in 2019. The Sage Sessions is a single-day event designed for Sage customers driving our economy. This is a must-attend event that delivers a learning, training and networking experience that will inspire you to drive your business forward. Focused on the Sage product portfolio and roadmaps, Sage Sessions provide Sage customers, partners, and accountants with actionable tools and insightful knowledge. Early bird pricing, good until one week prior to the event is $29. After that time the standard rate will be $49. At each stop of the Sage Sessions events, we expect a limited trade show with some access to demonstrations of third-party products and services. As of now, there is no list of the third-parties participating at a particular Sage Sessions stop. For more information visit the Sage Sessions 2018 website. Sage just announced the location for their first Sage Sessions stop of 2018. The company previously announced that a series of 10 local Sage Sessions would replace their single Sage Summit event in 2018. We have yet to spot a registration link. As soon as that link goes live we’ll update this post. Many people have asked where the annual Sage customer conference – Sage Summit – will be held for 2018. Sage Summit is one of the conferences produced annually by Sage North America. 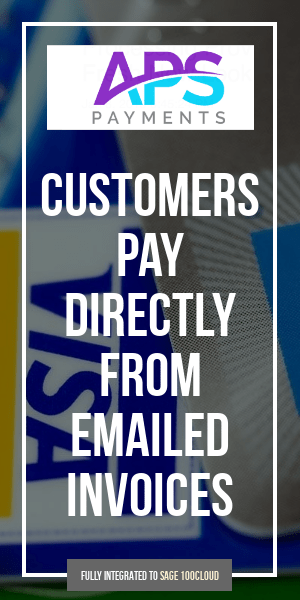 The format can vary from a single day to multiple days. Typically there are educational sessions, the opportunity for networking and a trade show. 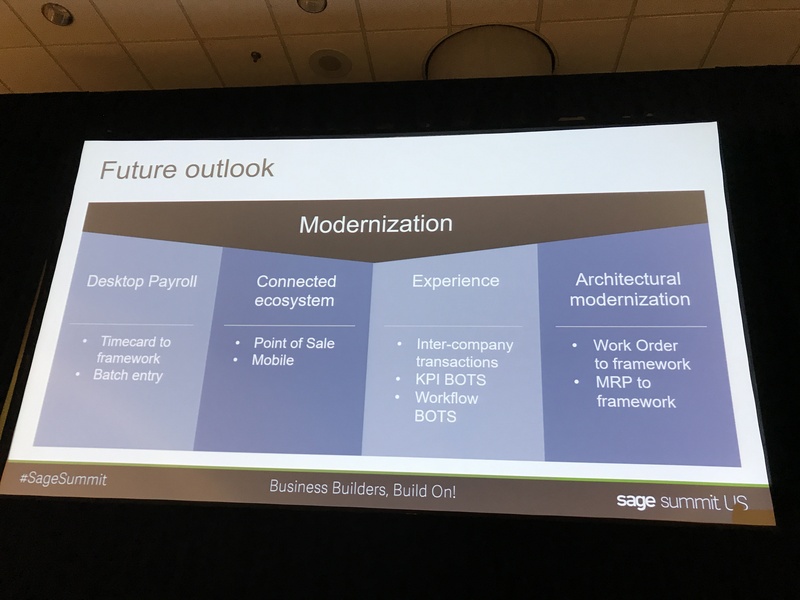 The products discussed at Sage Summit have included Sage 10o, Sage 300, Sage 500, Sage Fixed Assets, Sage Intelligence, Sage 50, Sage X3 (Sage Enterprise). For 2018, it appears Sage will host a series of local Sage Summit Tour events. This will be instead of a single larger Summit conference for 2018. Many of you joined us for the Sage Summit series in 2017. The eight-city tour around the world allowed us to engage with you in your local communities. Through this experience, it became clear to us that more business builders and their partners need access to events that help them transform the way they work. With that in mind, we want to provide a quick update on our plans for future Sage events. Sage Summit: Sage Summit events deliver multiple days of experiences and learning that evoke passion, emotion and inspiration. Many of you have asked about Sage Summit in the U.S. and U.K., and we anticipate hosting these events in 2019. More information will be available in mid-2018. Sage Sessions: Throughout 2018, we will host Sage Sessions around the world. Sage Sessions are single-day events that bring local businesses together to network, gain inspiration through expert advice and tailored content, and learn about new Sage technology. Sage Sessions events are already underway in many regions. Specific locations and dates for these events will be coming soon. Sage Forum: Sage Forum events are single-day events that offer highly-focused business agendas and content. Sage Forum events will be taking place around the world in 2018 and can take many formats, such as luncheons, business meetings, panels, or lectures. Conference events for many technology companies have seen their formats change over last few years. It would not be surprising to see events continue to change so continue checking with us as to the latest Sage events by signing up for our Sage email newsletter. I’ve just returned from Sage Summit in Atlanta. This is a trip I had not expected to make but last minute plans were changed and I found myself on a plane to Atlanta where I spent the better part of three days commuting by foot between the Hilton Atlanta and the Georgia World Congress Center, home of Sage Summit 2017 – Atlanta. Here’s a summary of the two-part session hosted by Sage to showcase planned developments for Sage 100 and Sage 100c. Before I begin, realize that the timeline and even features may change between now and the forecasted shipping date. Some features may be deferred or even dropped while others may be added. Job Cost is moving to the framework (ETA Sage 100 v2018 due October 2017) – a quick self-running demo was given of what is referred to as Job Cost 2.0. From those who have seen the update in more detail, it has been described as more of a migration than a big re-write. Work Order is not yet scheduled to be upgraded to the framework but discussions have begun about who will do the upgrade and on what timeframe. 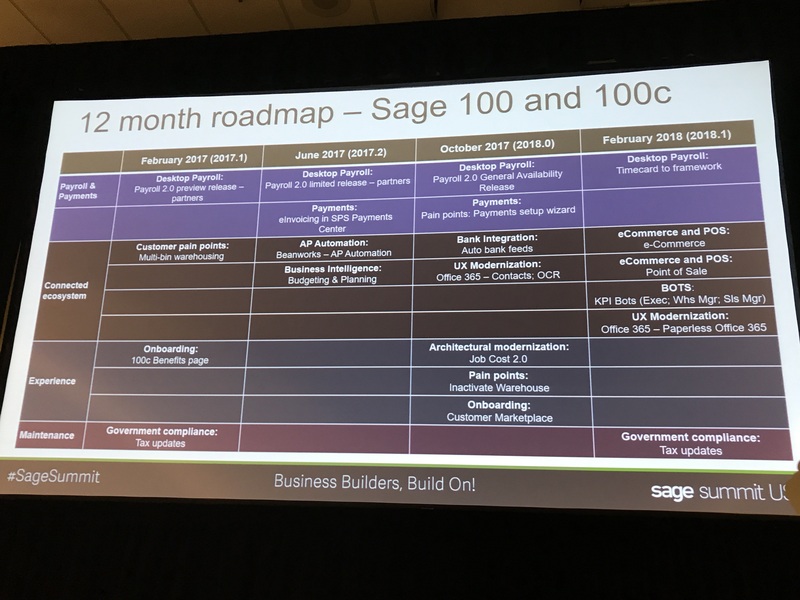 The remainder of the enhancements spotlighted on the roadmap appears to be integrations that will hook into Sage 100 or Sage 100c. What was shown during Sage Summit was very high level. There were few demos in the road ahead itself. 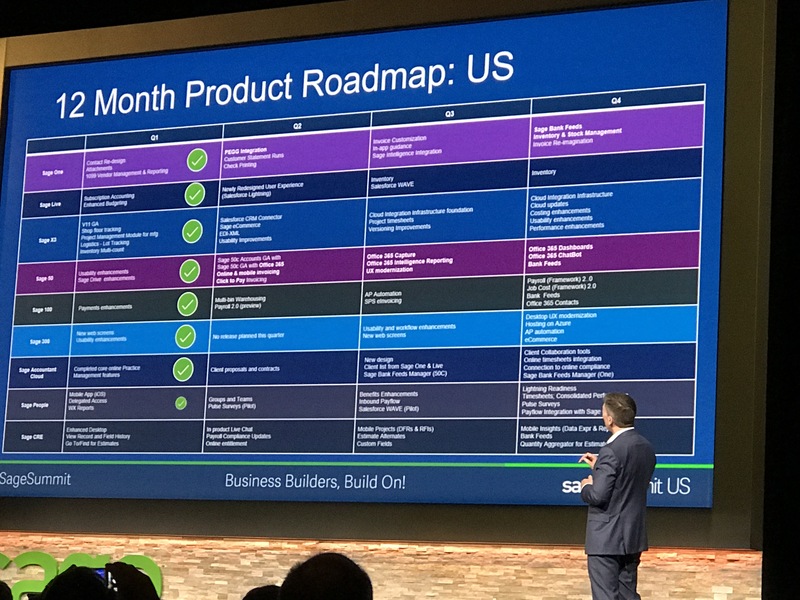 In the final shipping versions it’s likely we will see further smaller enhancements that Sage have not listed on their larger roadmap. 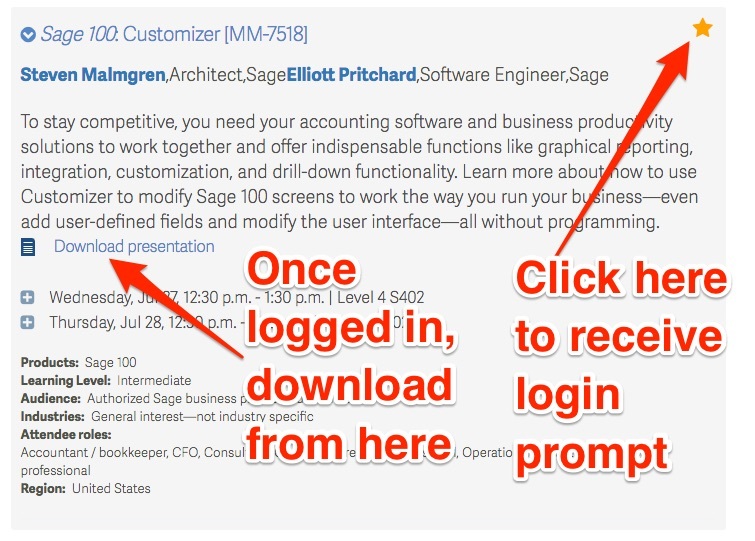 These enhancements will be available to everyone who is active on a Sage 100 maintenance or Sage 100c subscription plan. 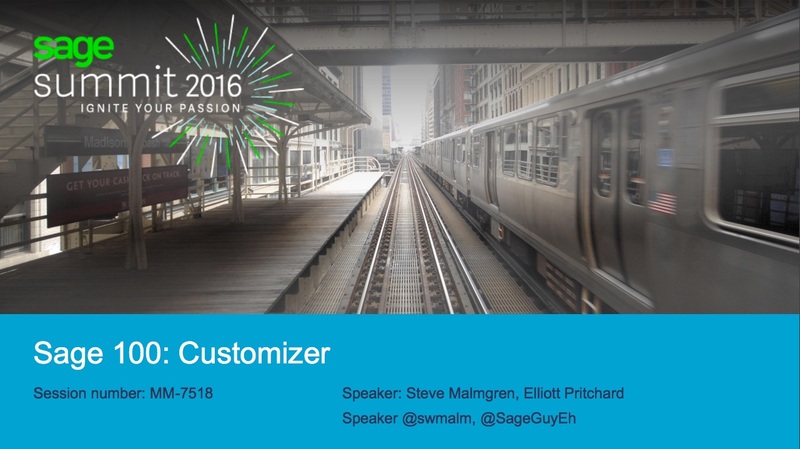 Sage Summit 2016 was held July 25-28, 2016 in Chicago, IL. Not all the presentations have been uploaded yet though there are enough that you might just find the one(s) you are looking for.